ABSTRACT: Results of high-resolution integrated stratigraphic studies (calcareous plankton and magnetostratigraphy) of three Mediterranean sections (La Vedova in Central Italy, Contrada Pesciarello in Sicily and St. Peter’s Pool in Malta) and one deep-sea core from the mid-latitude North Atlantic (DSDP Hole 608) are here synthesized. 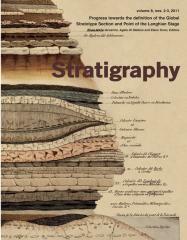 They are compared with those of previously studied deep marine sections in the Mediterranean including the historical stratotype, with the aim to select the most suitable section and criterion to define the Langhian GSSP (Global Stratotype Section and Point). This study significantly improves the existing magnetobiostratigraphic framework for the upper Burdigalian-lower Langhian and opens new perspectives for defining the Langhian GSSP. An extensive review of the first stages of the Globigerinoides-Praeorbulina evolutionary lineage pointed out that the Praeorbulina datum, historically used (and/or suggested) to approximate the base of the Langhian, coincides with the First Occurrence (FO) of P. glomerosa curva instead of P. sicana which is here included in the genus Globigerinoides. The FO of P. glomerosa curva occurs close to the C5Br/C5Bn.2n reversal boundary. As a consequence, the two recommended guiding criteria to recognize the base of the Langhian, i.e. the Praeorbulina datum and the top of Chron C5Cn.1n, can not be applied together, as these two events differ in age by ~740 kyr. The selection of either of these two criteria will imply a different duration for the Langhian: relatively short, in case the FO of P. glomerosa curva is selected, or longer and probably more acceptable, in case the top of Chron C5Cn.1n is selected. The primary calcareous plankton biohorizons which, according to our data, appoximate the top of Chron C5Cn.1n, are the Last Common Occurrence (LCO) of the calcareous nannofossil Helicosphaera ampliaperta and the LCO of the planktonic foraminifer Paragloborotalia bella. Other calcareous plankton events have been recorded close to the same magnetic reversal, such as a short influx of H. ampliaperta (Ia1) and the Paragloborotalia siakensis Acme0. The P. siakensis Acmea End (AaE) and the Sphenolithus heteromorphus Paracme End (PE) represent the primary plankton biohorizons associated with the P. glomerosa curva FO. Two of the three studied Mediterranean sections (La Vedova and St. Peter’s Pool), each from different point of view, are potentially suitable to be proposed as candidates for the definition of the Langhian GSSP. Yet, further studies on stable isotope stratigraphy and cyclostratigraphy, including astronomical tuning are necessary before the most suitable section and guiding criterion can be selected.